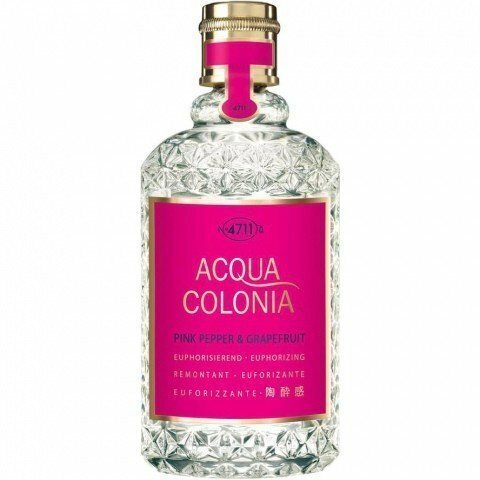 Acqua Colonia Pink Pepper & Grapefruit (Eau de Cologne) is a perfume by 4711 for women and men and was released in 2013. The scent is fresh-citrusy. It is being marketed by Mäurer & Wirtz. The expected freshness kick remained unfortunately from .. Recently - more precisely, on 20 March at 22:59 - we had spring in Vienna. Time to take a look around and find out what's trendy in fashion now, and find a suitable new fragrance to get you started in the new season. I wish for something fresh, light, citrusy. Grapefruit, maybe. It makes you feel so exhilarated. I hear the smell of grapefruit makes us look younger. I can well imagine. In any case, the euphoric effect of grapefruit has long been well known from aromatherapy when you encounter it olfactorily. Maybe that's why I love this bright, cheerful scent. Therefore, Aqua Allegoria Pamplelune and Aqua Allegoria Pera Granita, both by Guerlain, are among my perfumes and are often used by me. Before I decide to buy the perfume, I try it out with a tester for safety's sake. I don't know it yet. So there they all are, the currently popular 4711 Eau de Colognes. The presentation of all fragrances is very appealing. The Pink Pepper & Grapefruit, for example, comes in a pretty pale green box with twigs of pink pepper. I don't like the glass flacon, which is based on cut crystal glass, so much. This kind of cut crystal just seems too old-fashioned to me. It's like the '50s, when that cut was fashionable. Apart from the set with the shower gel, the EdC is available as a spray in a 170 ml bottle. The price for the latter ranges between a fine € 20.99 and less cheap € 47.95 on the Internet. I'm starting my test. I imagine Pink Pepper & Grapefruit refreshing. Urban, a little cheeky perhaps, trendy, young and citric. An ideal fragrance for warm days. But that's not exactly what I find here. This cologne only seems fresh to me at the moment of spraying on. The hoped for citric fireworks are limited from the beginning. I'm afraid so. But the pepper with its spicy aroma is immediately very present. The combination of spicy and fruity is not bad for me. But it just doesn't work on me. The fragrance quickly develops something bitter and dull in me - I can't describe it any other way. As I said, I don't find the desired lively brightness and tangy freshness of grapefruit here, or too little. The scent doesn't change either. I stand around for a while, always sniffing the back of my hand. The only thing that happens is that the fragrance quickly becomes noticeably weaker and weaker. I've hardly ever found a perfume whose fragrance fades so quickly before. Okay, it's an eau de cologne. But also from this group I know many fragrances with good durability - not least the classic of 4711. Pink Pepper & Grapefruit could at best be considered body crap in my eyes. It doesn't convince me, anyway. The thought of buying it is moving further and further away. I had a completely different idea about this fragrance. I don't know of any grapefruit scent that's so dark. 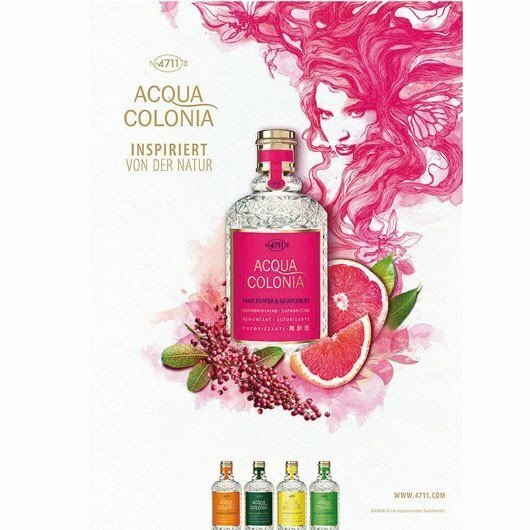 But since I am already standing in front of the shelf with the 4711 Acqua Colonias, I try out the Eau de Cologne Blood Orange & Basil as well as Mandarine & Cardamom. Both seem very interesting to me because of their composition. But they also disappoint in the end. It's like someone wrote in a review: You get what it says. 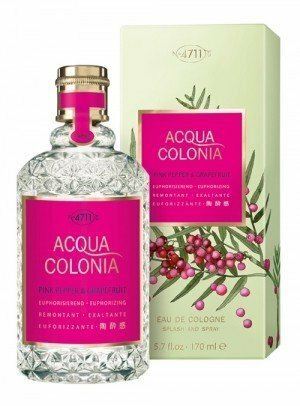 And I add: But nothing more ... Maybe 4711 was inspired by the Guerlain series Aqua Allegoria, in which there are also scents that combine fruity notes with spice plants - e.g. Mandarin Basilic, which is even in my collection. But what a difference! Also in the price, of course. In flacon design anyway. But especially in the fragrance. There are many things that Germans can do excellently. Poetry and thinking, inventing useful things, composing, writing literature, painting, constructing technical or physical precision devices and much more. The creation of subtle scents, however, does not seem to be their greatest strength - compared to the French, for example. And so the fragrance experience at 4711 is quite one-dimensional, almost coarse. You get what it says. That's all. In other words, I miss the refinement, the play with aromas, with head, heart and base notes, the charm of the change of a fragrance, where one always discovers new facets. Pink pepper and grapefruit - what charming nuances and contrasts would that have offered? But the fragrance remains as it is from beginning to end. And the end comes as mentioned so fast that you can hardly believe it. Of the three 4711s I tested, the "Pink Pepper" lasts the least, and by far the least. For the price, which is not so low for an Eau de Cologne, one could have expected more. "Pink Pepper is considered a unisex scent. I don't have much experience with this kind of perfume. I usually prefer feminine scents. Maybe that's why the scent is so bitter. I would have preferred more citric and less bitter. I'm sorry if, unlike others, I don't find this perfume to be the great refreshing scent for hot summer days. There are better ones - like Guerlain's Pamplelune, which is not a miracle of durability, but where you don't have the feeling of having to spray every 2 minutes, like it is with "Pink Pepper". The fragrance is spicy rather than fresh. But also the tart note has to my taste too little refinement and subtlety. More could have been done with this combination. Maybe some bergamot in the beginning, lemongrass, verbena and cedar, maybe even mint, then it would have worked better with the summer resort. I have no problem with the brand 4711. The classic Eau de Cologne with lots of bergamot still offers a pleasant refreshment and is still quite wearable today, I think. 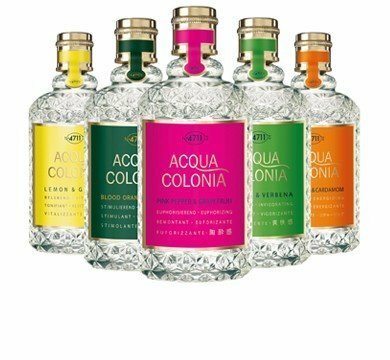 The Acqua Colonias, which I tested yesterday, are, however, a little stuffy and uninspired according to my taste. You have to like it - or not. Conclusion: In my opinion, these fragrances are something for the more unambitious who may have little experience compared to more interesting fragrances of this kind. With the Guerlain fragrances of the Aqua Allegoria series, which are similar in concept, they cannot keep up in any way in my opinion. As always, the same applies here: Trying is about studying ..